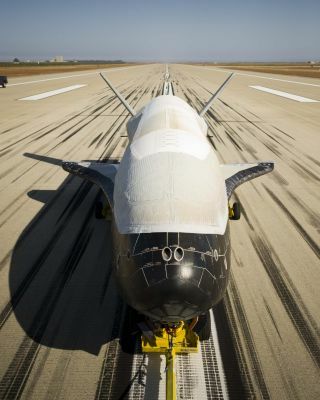 Designed to be launched like a satellite and land like an airplane, the second X-37B Orbital Test Vehicle, built by Boeing for the United States Air Force’s Rapid Capabilities Office, is an affordable, reusable space vehicle. This story was updated on Saturday (Nov. 3) at 9:45 a.m. ET. The third launch of the Air Force X-37B spaceship, a secret space plane used for classified missions in Earth orbit, has been postponed, officials said. The liftoff of an Atlas 5 rocket set to carry the robotic X-37B Orbital Test Vehicle (OTV-3), which looks like a mini space shuttle, has now been slipped to Nov. 27, pending confirmation that the rocket range can support the launch. According to a statement today from spokesperson Jessica Rye of United Launch Alliance (ULA), which builds the Atlas 5, the leadership at ULA and the Air Force agreed to postpone the launch of the X-37B for two weeks. Holding off on the liftoff of the Atlas 5 will allow for additional flight data anomaly investigation activities of the Delta 4 engine glitch and a thorough "crossover assessment" for the X-37B OTV launch vehicle, officials said. Although the Atlas 5 that's being readied to propel the unpiloted OTV-3 into Earth orbit utilizes a different model of the Pratt & Whitney Rocketdyne RL-10 engine than the Delta 4, Air Force Space Command commander General William Shelton asked for a discretionary accident investigation board (AIB) to investigate why the Delta 4 RL-10B-2 upper-stage engine did not perform as expected. As its standard process, the Air Force reviews all flight data to determine if it's ready to proceed with the next liftoff. "This flight data anomaly investigation is being conducted with investigative processes that have been refined over decades of launch experience and include extensive reconstruction of the flight data with analytical models, as well as detailed inspections of several engines," Rye said in a Nov. 2 statement. The X-37B mission was originally slated to blast off from the Space Launch Complex 41 at Florida's Cape Canaveral Air Force Station on Oct. 25, and then was slipped to Nov. 13, and now Nov. 27. When the Air Force robotic space plane — carrying a classified payload — heads for space, it will be the third launch for the X-37B program, and will mark the first re-flight of one of the space planes built by Boeing Government Space Systems. This same vehicle flew the first flight of the X-37B program back in 2010. That maiden voyage of OTV-1 lasted 225 days, eventually zooming in on autopilot over the Pacific Ocean and gliding down onto a specially prepared runway at Vandenberg Air Force Base in California. Similarly, the OTV-2 mission, using a different space plane model, made a Vandenberg touchdown on June 16 of this year, having remained in orbit for 469 days, more than doubling the 225 days its sister ship stayed on orbit. The X-37B craft is 29 feet (8.8 meters) long and 15 feet (4.5 m) wide, with a payload bay about the size of a pickup truck bed. Flights of the X-37B are conducted under the auspices of the Air Force's Rapid Capabilities Office. According to an Air Force factsheet, the Rapid Capabilities Office is working on the X-37B Orbital Test Vehicle "to demonstrate a reliable, reusable, unmanned space test platform for the United States Air Force." Editor's Note: This story was corrected to note that this is the third launch of an X-37B spacecraft, but it is not the launch of the third X-37B, since only two vehicles have been built, and one is being reused.